On this sunny Wednesday in May is it really 96°F outside? Oh, it sure is! Time to enjoy a glass of icy, cold solar Green Tea. Ah, that sounds so good! Yesterday, the Green Tea brewed in my sunny front window. My favorite glass pitcher was filled with cold water. Three Green Tea bags were added and in four hours the tea bags were removed. The pitcher was covered and placed in the fridge, ready for a hot day such as today! On the same shelf is a ripened Avocado! Thank you to my Blogging Friends for your Avocado hints! :) Over the years I have come to enjoy Tofu, Avocados and Green Tea! Life is good! Do you drink Green Tea? I like it hot or cold. Usually, I use the tea bags. However, in my fridge there is a container of Matcha – powdered Green Tea. If the powdered Green Tea is used to make hot tea, it requires whisking the tea leaves with the hot water. 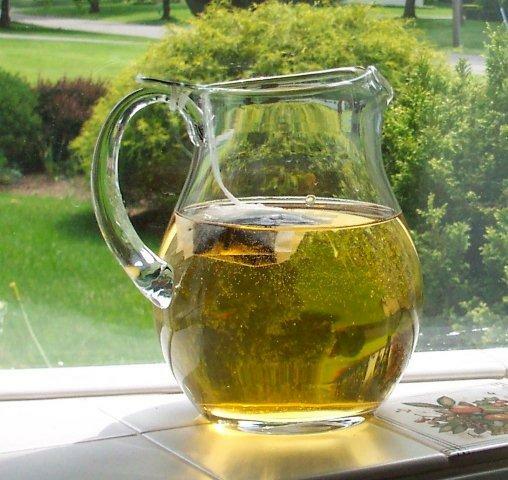 Now, it’s time to enjoy the view outside while sipping on my iced, refreshing Solar Green Tea! Visiting another area of our vast country and enjoying the variety of regional foods is always a special treat! In the past few days my DH & I traveled to Houston, TX for our niece’s beautiful wedding. While staying in The Woodlands, we took a stroll down the pedestrian walkway along the Waterway Koi Pond. Click here for info. Looking down into the Koi Pond, various sized Koi swam gracefully. Some were very large and in an area close by, little fish vigorously swam. An informative young boy and his mom were also admiring the peaceful scenery. He told us where to look for the baby fish. While standing on a walking bridge overlooking the pond, beautiful colorful Water Lilies bloomed. Gazing down we could see the leaves and buds of the plant below the water’s surface. A gentle breeze caused ripples in the pond. How gorgeous and tranquil! And it is a bit of info to share with school groups when I give my Japan Tours at the Quadrangle. Who knew I would bring back to MA some info for my tours? Each day we ate delicious food! Avocados were part of a meal – sometimes mashed and at other times sliced or cut in chunks as part of a salad. Yummy, this is one tasty fruit! 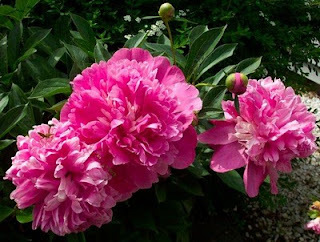 Yes, they are available to me in my grocery stores, but I never purchase them – just walk past the display in the Produce aisle. Well, that is to change. A couple of slices of Avocado on a Tuna Salad Sandwich would be so good! Tomorrow, when I replenish the fridge guess what item will be on my grocery list! Do you have recipes using Avocados? We must have blinked our eyes, again! Brrrr! It is a bit chilly. The long sleeved shirts are very comfortable. 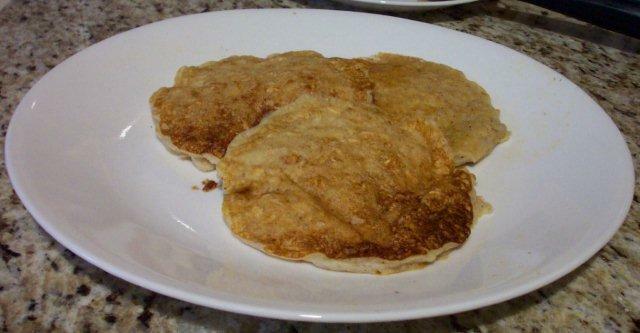 When it is chilly outside, a breakfast of Awesome Oatmeal Pancakes tastes so good! Oats are a staple in my kitchen. Who can resist an Oatmeal Cookie filled with Raisins and Craisins? 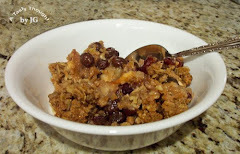 Apple or Peach Crisp make for tasty desserts. Eating a bowl of Creamy Oatmeal in the winter while listening to the snowplows clearing our streets go hand in hand. However, it is now May. Light but filling, hearty, nutritious Oatmeal Pancakes are enjoyed any season of the year at my kitchen table. These pancakes have a simple name, but taste delicious. A two-step easy process is used. The night before these scrumptious pancakes are made, Oats and Buttermilk are combined in a bowl and refrigerated. In the past couple of years I have been replacing Vegetable Oil and Butter/Margarine with Olive Oil (for sauteing & baking) whenever possible. On Saturday AM while getting the batter ready, the Olive Oil was added rather than the melted & cooled Butter/Margarine. My Hubby’s response? “Yum! The pancakes are lighter than usual.” Now, Olive Oil will always be used in this recipe! The topping of choice on Saturday? Ah, Strawberries! I had defrosted a package in our fridge that was waiting to be used. Breakfast was hearty and light. The strawberries added color! 4 TBS. Olive Oil ( sauteing & baking) I use Carapelli. 1. Combine Oats and Buttermilk in a bowl, cover & refrigerate overnight. 2. Next morning – add additional 1 Cup Buttermilk to mixture so it can be combined easily. 3. Stir Flour, Sugar, Baking Powder, Baking Soda & Cinnamon. 4. Add to Oats mixture. 5. Add Egg + Egg Whites and Olive Oil. 6. Stir all adding small amount of Buttermilk, if needed. 7. 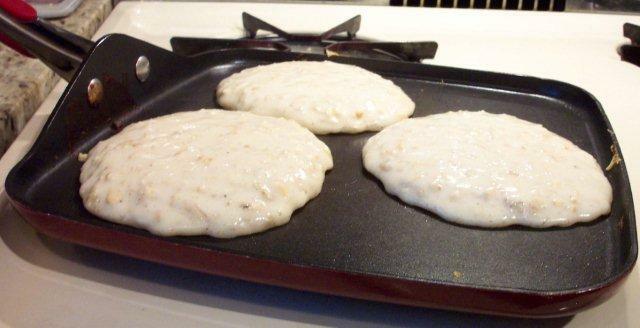 Pour ¼ cup portions on heated non-stick griddle. 8. When brown, flip over and cook other side. The past few days have been a tad hot! 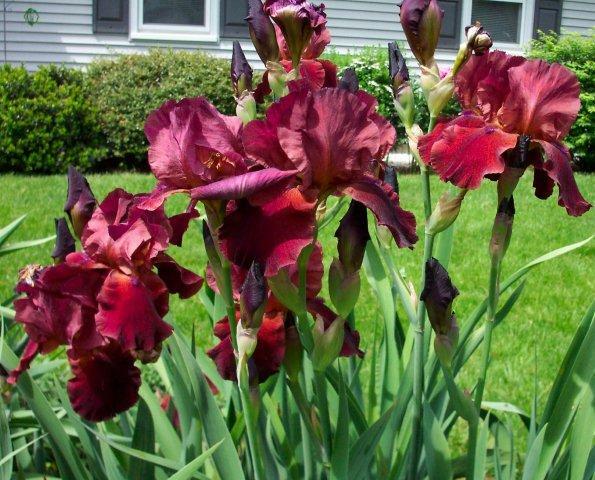 In New England we know that the weather will change while we blink our eyes. And it sure has! On Friday I placed a package of frozen blueberries in the fridge to defrost, so Yummy Blueberry Muffins could be baked the next day. My Hubby and I had plans for Sunday - drive in and visit our son and his family. Well, we did drive in, had a great time, but brought no muffins. This morning I opened the fridge door and lo and behold – defrosted Blueberries. Over the weekend while we were wearing shorts and short-sleeved shirts, the three bananas that were sitting in the fruit bowl really ripened. Ohhh! Now, Bananas plus Blueberries! 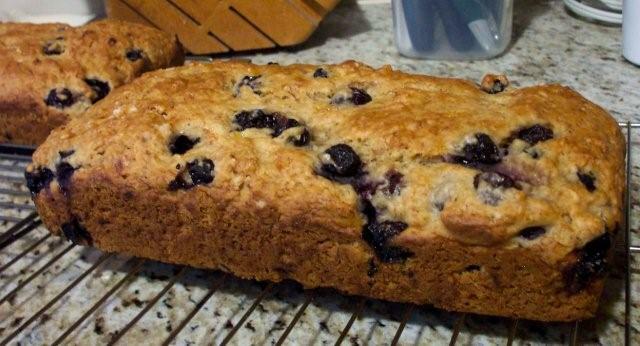 While googling, I located the recipe Kelly's Blueberry Banana Bread that Wildflour shared on recipezaar.com. It is below. Kelly’s Blueberry Banana Bread shared by Wildflour. 1. In large bowl, mix all ingredients except blueberries for about 30 seconds. 2. Fold in frozen berries. 3. Pour into 2 greased 8 1/2x4 1/2x2 1/2 loaf pans that have been greased on the bottoms only. 4. Bake in 350º oven for 55-60 minutes, til toothpick inserted in center comes out clean. 5. Cool slightly, loosen sides with knife from sides of pan, turn out onto rack to cool. 6. When cool, wrap tightly with plastic wrap, keep refrigerated. 7. Best the next day! 8. *Ialways bake blueberries frozen in breads and muffins so they hold up perfectly, and you don't end up with a hollow blue hole, lol. I added 1/8 tsp. Nutmeg. My Blueberries were already defrosted. I used Olive Oil - for sauteeing and baking - rather than Vegetable Oil. The batter is a bit dry, so I also added an additional one Tablespoon Olive Oil. My bread pans are 9-Inch Loaf Pans. I was so pleased to locate a recipe containing both Blueberries and those three overripe Bananas that were sitting on my counter. This Bread is absolutely delicious! Have you ever combined these two fruits? Sunday was full of surprises! Driving down the Mass Pike we learned that our younger son and his girlfriend were at the Riverside T station. After stopping there we all headed to our son’s and daughter-in-law’s home - I celebrated Mother’s Day a week early. Sweet! What a beautiful day! To all you Mom’s – Happy Mother’s Day!